Welcome to issue #4 of Jade Woodruff’s “Life on Anime” – a new column here at Nerd Nation dedicated to reviewing all of the great anime titles out there (of which there are many – as most of you reading this already know!) from the perspective of a life-long anime fan. For this installment, we will be tackling Blue Spring Ride, a 12-episode anime series based on the romance shoujo manga written and illustrated by Io Sakisaka and serialized in Bessatsu Margharet. It was adapted to one season of anime by Production I.G. with a rumored OAV to follow. Futaba Yoshioka wants to “reset” her life. In middle school, girls ostracized her because she was cute and took pride in her appearance, which led to boys liking her. The only boy Futaba liked, Kou Tanaka, moved away before she could tell him how she felt. Now that she’s in high school, Futaba is determined to make female friends by doing the exact opposite of what she did in middle school. She gorges on food, doesn’t style her hair, and acts unladylike to avoid making her friends jealous. Kou transfers back to her high school under a new surname: Mabuchi. He’s colder than he used to be and Futaba grows interested in finding out what happened to make him so distant. In doing so, Kou quickly admits to liking her in middle school, but after he’s seen the “new” Futaba, he feels differently. Blue Spring Ride does a lot of good things, even though follows the same shoujo plot line that other shoujo follow: namely Kimi ni Todoke which happens to be another Production I.G. series. It’s about a girl who doesn’t fit in, although this time by choice, and a guy who’s charismatic, popular, tall, slender, and has dark hair. No surprises there. It’s exactly what you sign up for when you start watching shoujo. The initial premise, however, was interesting and unique. Futaba’s “friends” aren’t really friends at all. In order to just have friends, she’s made these superfluous relationships with girls who accepted the “fake” Futaba. She never expresses her own opinion or acts like herself because she’s afraid of losing their friendship. In this regard, Blue Spring Ride sends a very clear message to young girls: just because they say they’re your friends doesn’t mean they are. And, on the same note, just because they say they like you, doesn’t mean they do. For teenage girls, this is a difficult concept to grasp. Blue Spring Ride not only hints at how “friends” can even be bullies, it shows what happens when someone tries to leave that circle: loneliness included. This is about the time Kou shows up. He’s older, colder, and more handsome than Futaba remembers. She’s immediately intrigued and wants to reconnect with him. After learning that he used to care about her but doesn’t anymore because she doesn’t take care of herself and therefore became the sort of person that he doesn’t like, Futaba is determined to show him that’s she’s different, but still lovable. She doesn’t change because of Kou. This is another important message: don’t change for someone else. If you’re going to change, it needs to be because you want to better yourself for your own sake. Futaba’s decision to change herself comes after she sees what her “friends” look like while they’re bullying a girl, Sakura, who Futaba sees as a high school version of her middle school self. She realizes that she’s become the sort of person she hated in middle school. Sakura is aware of the jealously other girls have toward her, but she’s in a better place mentally than Futaba was in middle school. Sakura knows that, even though it’s painful, this is who she is and she’s happier being herself, even if it means she has no female friends. Futaba ditches the fake friends and starts trying to build meaningful relationships. This is where the story becomes more like traditional shoujo. It introduces characters that meet generic archetypes without fully developing them. Honestly, I’ve grown to expect this of shoujo titles. Unlike Kimi ni Tokode, there’s little development to the supporting cast. Little, if anything, is known about them, their past, and their desires other than that they like someone in the series. In some cases, the person they like has more than one admirer or doesn’t share their amorous feelings. As the story progresses, Futaba changes and the focus of the show shifts to Kou. This is what I found delightful and intriguing about Blue Spring Ride. The male lead isn’t a cardboard cutout like viewers are led to believe. He’s flawed. I love a flawed character. They’re much more interesting than characters who only “do good” or comply with “social norms”. As Futaba learns more about Kou and why he’s changed, there’s plenty of moments to make your heart race and an equal number that bring on the feels. Kou was the most interesting part of the series for me. Watching him come out of his shell was endearing. I’d venture to say that his character showed the most growth – even compared to Futaba, the lead female. Then the story just ends. There were moments of hope in episodes 11 and especially 12 that something more would come of Blue Spring Ride, but it never did. After Kou’s story is wrapped up neatly, Futaba reflects on the way she’s changed and how she’s grown closer to Kou. In the last five minutes of the show, the friends all decide to go somewhere for summer vacation. Each character announces in some way or another that they haven’t given up on the person they like. They’re each going to fight even harder to win them over in the summer. What a blatant set up for a season 2 that hasn’t been announced. There is a rumored OAV that will supposedly be released with the next installment of the manga. But, there’s no guarantee that it will provide closure. 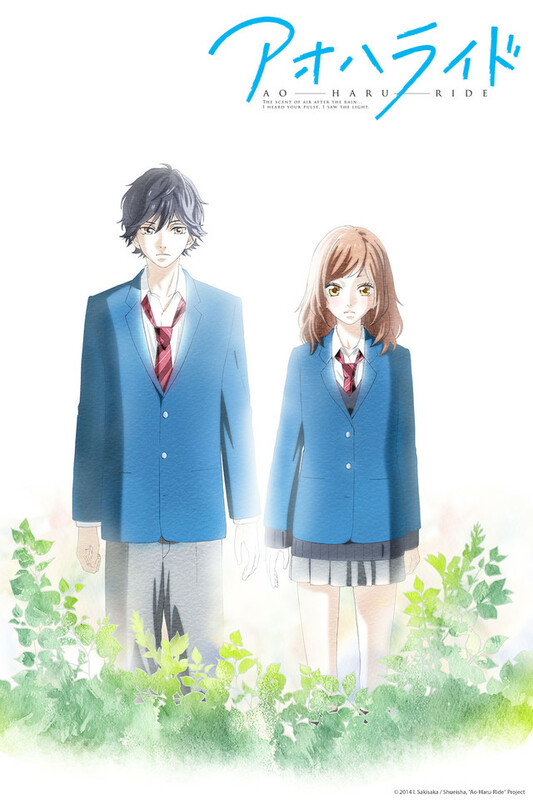 Like many shoujo anime, Blue Spring Ride has its moments where it’s gripping and touching. It lulls and sprints. The animation is pretty and suits the genre (as expected of Production I.G.). The growth of the male lead was particularly strong for a shoujo title. That and the strong messages about personal growth and change make this a must see in my book. It’s not the best shoujo you’ll ever watch, but it’s pretty darn good. I would have rated it higher had it actually ended. This is a topic close to my heart cheers. This was a really excellent post. Thank you for this!